Licensed with the State of Michigan and fully insured, Todd's Services, Inc. (TSI) specializes in landscaping, retaining walls, brick pavers, hydroseeding, sprinkler systems and outdoor structures. We are one of the largest residential landscaping companies in Michigan, and continue to grow at a rapid pace serving customers throughout Southeastern MI. Our company is committed to providing professional landscaping contractor services in a reliable, timely and efficient manner. Contact us today for more information! To request a quote, contact us at 810-231-2778 or fill out our online request form. A member of our design staff will review your information and contact you within 24 hours to discuss your project and answer your questions. I had contacted Todd's for this year's work since you had provided superior services a few years ago to landscape a new sun room area. This year's work was to tie in with the prior work, and provide attractive and accessible access to my home for my handicapped mother. The project needed to be completed before I could move her into my home. Tom Hall quickly understood both my needs and level of stress and designed and directed the work with good humor and efficiency. He provided sincere followup to assure that I was satisfied. I don't have all the crew members' names or would thank each individually...all the way to Rolando who in the final hours of finishing the projects maintained professionalism and patience when a landscaping product was delayed in delivery. My neighbors who have used Todd's Services did so after observing their work on my property. I'll continue to support and pass good report. Thank you everyone!" The crew was prompt, very friendly, and finished up in one day. I will be calling again next year." They worked hard and did a great job. They cleaned-up after they completed the job. The irrigation person did a good job reworking my irrigation system - was helpful with suggestions on what should be done. I would and have recommended Todd's (Rolando's team) because they were professional, friendly and did a great job." 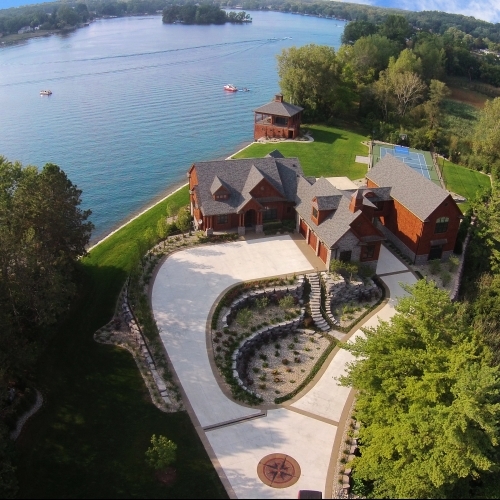 We are one of the largest residential landscaping companies in Michigan, specializing in professional landscaping services including stamped concrete, brick pavers, seawalls, retaining walls and more. In addition to contractor services, Todd’s Services offers commercial lawn maintenance, snow removal, sprinkler system installation and winterizations, and our experienced staff is ready to answer any questions you may have. We are certified by the following organizations and committees in the State of Michigan. We are committed to providing professional services and are prepared to handle landscaping projects of all shapes and sizes. Browse our portfolio of photos and read testimonials from real customers to learn more about our company.